Adults obesity has been doubled in the the US throughout the last 30 years. Being overweighted harms your health and costs your boss. 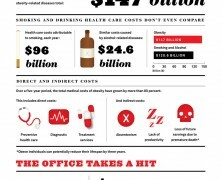 Think that obesity medical costs are twice as much as smoking and drinking health care costs.